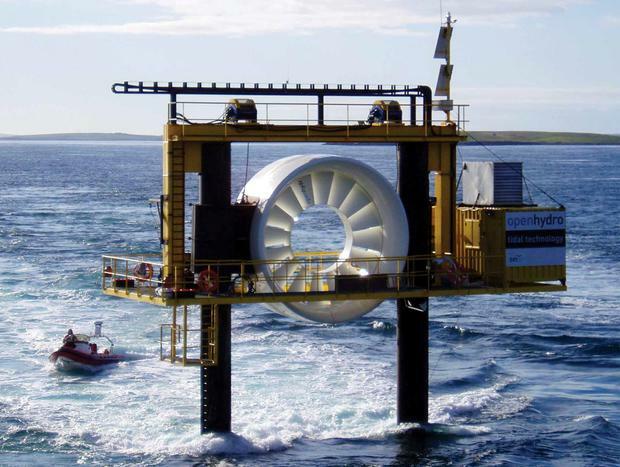 OpenHydro develops turbines that generate electricity from tidal energy. The main shareholder in the troubled renewable-energy developer OpenHydro has told the High Court it is opposed to the group going into examinership and instead favours liquidation. Rossa Fanning SC, counsel for 71pc shareholder Naval Energies SA, said the decision to oppose examinership had been taken “more in sorrow than adversity”. His client believed OpenHydro would suffer further losses if it continued to trade, and French investor Naval’s preference is that the group be wound up, Mr Fanning said. Last week, insolvency practitioner Ken Fennel was appointed interim examiner to Dublin-based OpenHydro Group and its subsidiary – Open Hydro Technologies – after the court heard that an independent expert’s report found there was a reasonable prospect of survival. The appointment was made following an application by shareholders who own 12pc of the group, some of whom had been involved in establishing OpenHydro. The business could survive if it gets new investment, restructures and secures a debt-cutting scheme of arrangement with creditors, the minority shareholders had claimed. The application for examinership came weeks after the High Court appointed Michael McAteer and Stephen Tennant of Grant Thornton as joint provisional liquidators to OpenHydro, after being told both companies were “seriously insolvent”, with debts of approximately €280m. In front of Mr Justice Denis McDonald at the High Court on Tuesday, Mr Fanning said Naval Energies had invested more than €260m in the group since 2013, but sought to have the company wound up after deciding to cease funding the loss-making enterprises. Naval Energise also claimed there was a breakdown in relations between the group’s senior management and its board of directors. Lyndon MacCann SC, for the provisional examiner, said it was imperative that the hearing to confirm Mr Fennell’s appointment should take place “as soon as possible”. Neil Steen SC, for the 12pc shareholders, said his clients believed examinership would be more advantageous to all parties. Judge McDonald adjourned the matter for hearing on September 5.